How would you manage a bilateral total knee arthroplasty patient who is suddenly experiencing severe pain in both knees a couple weeks after oral surgery? Or what about a total hip arthroplasty patient who underwent a seemingly uncomplicated head and liner exchange but presents 10 days later with a draining, infected wound? And how about the otherwise healthy total hip arthroplasty patient who presents 2 years later with such severe pain that she is unable to bear weight? 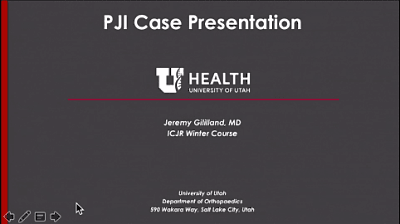 These are the 3 cases that were presented during a panel discussion on infected total joint arthroplasty at ICJR’s Winter Hip & Knee Course. The 5 panelists – Jeremy M. Gilliland, MD; Joshua T. Carothers, MD; Gwo-Chin Lee, MD; Michael D. Ries, MD; and Gregory G. Polkowski, MD – reviewed the radiographs, lab results, and medical and surgical histories of these 3 patients and provided commentary on management options. A 56-year-old male patient who had undergone simultaneous bilateral total knee arthroplasty 5 years prior presents with acute onset of bilateral knee pain and effusion. He is unable to bear weight. Two and half weeks before presentation, he had undergone oral surgery to remove an infected tooth. He did not take antibiotics prophylactically before the procedure; the oral surgeon had told him it was not necessary. The patient’s past surgical history is also significant for aortic valve replacement, for which he takes warfarin. A 55-year-old male patient with a BMI of 33 who had undergone right total hip arthroplasty 20 years prior presents with progressive right peritrochanteric hip pain. Although he takes no medication, he reports a medical history of rheumatoid arthritis, psoriasis, diabetes mellitus (hemoglobin A1c of 8.3), and hepatitis C infection. After he is optimized by his primary care physician, the patient undergoes a head and liner exchange. Ten days later, he presents with a draining incision; his culture grows Staphylococcus epidermidis. Unfortunately, the patient gave his healthcare providers incorrect contact information and they have no way of informing him of the infection. Two weeks later – 3.5 weeks after surgery – he returns to the emergency department with a draining wound. A 54-year-old female patient sustained a right acetabular fracture and foot drop in a motor vehicle accident in 2013. She underwent open reduction internal fixation that was complicated by an infection requiring multiple irrigation and debridement procedures. A year later, she developed groin pain and underwent right total hip arthroplasty. She was doing well, but in 2016, she presents with severe pain and the inability to bear weight. She is otherwise healthy, with a well-healed incision and no drainage. She is neurovascularly intact, other than the foot drop from the original accident. Her culture grows methicillin-resistant Staphylococcus aureus. Click the image above to hear what the experts had to say about managing these patients.